Sick weeks are always crazy so I'm sorry for being a little bit behind. Better late than never, right? This week was a huge success as far as toddler meals went! 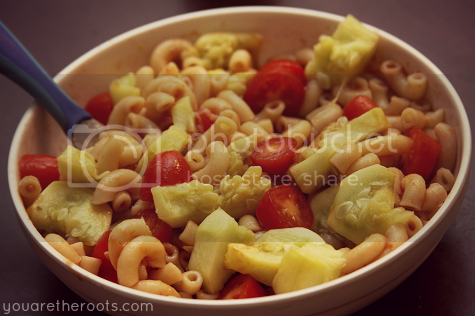 This Veggie Pasta was a huge hit. I made some Dreamfields pasta and when it was ready and drained, tossed it with some Pomi tomato sauce. I sliced up some grape tomatoes (Ethan's current favorite food) and some chunks of squash and zucchini that I'd steamed. 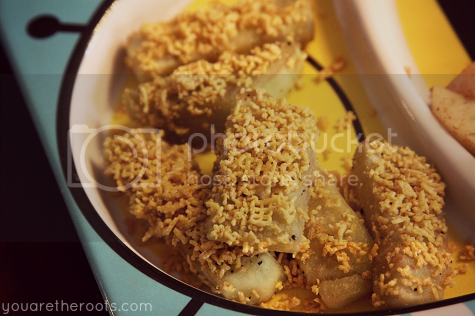 I had made these baked cinnamon pears and apples as a snack for Ethan to munch on throughout the week while the weather got cold outside and we were stuck cooped up in the house. I had sliced up some (peeled) pears and apples and tossed them on a cookie sheet with a light drizzle of agave. I sprinkled cinnamon and nutmeg on top and baked them at 375 degrees for 10 minutes. After 10 minutes, I used a basting brush to toss the apples and pears around in the agave and spices and continued to bake them for 15 more minutes, until softened. These Corn Chex Coated Eggplant Strips were an accident, somewhat. I always make up fresh breadcrumbs except what with Ethan being sick, I hadn't gone to the grocery store and, well, we were out of bread. Oops. My husband had a box of Corn Chex that caught my eye, so I smashed some up and after basting strips of eggplant with some organic olive oil, rolled them in the mashed up cereal. I gave the strips a sprinkle of black pepper, sprayed them with a drop of cooking spray and baked them at 375 degrees for 35 minutes. Ethan loved these and I think the crunchy coating was something fun and different! 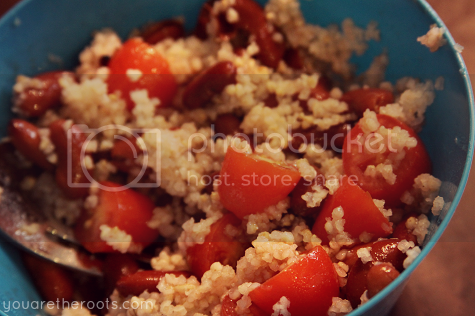 This couscous with tomatoes and red beans was probably Ethan's favorite meal of the week. He finished all of the leftovers, too. I grated some fresh garlic over the water before I boiled it to add in the couscous. Once the couscous was cooked, I added some black pepper and a dash of cumin. I mixed in some kidney beans and some more of Ethan's beloved grape tomatoes. 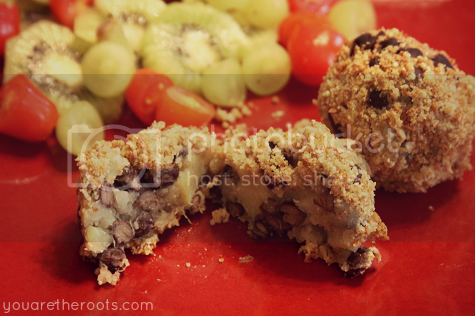 These potato, bean and veggie balls are what happens when you really need to go to the grocery store and realize you have nothing at all to feed your child. Ethan came running up to me holding a potato he managed to steal from the refrigerator and I used my imagination with what I had on hand. 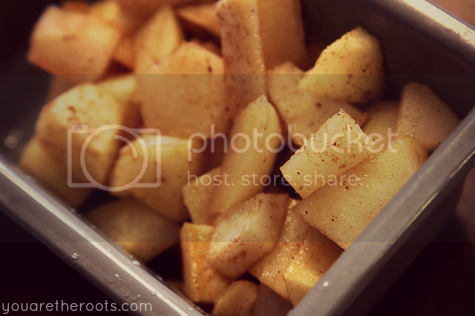 I baked the russet potato and steamed a yellow squash. I used a fork to mash up the softened squash and insides of the potato until they were combined together and then I added in some black beans. I formed little balls with the mixture and then rolled them in fresh bread crumbs that I made with millet and chia bread and baked these at 350 degrees for 20 minutes. Ethan went nuts for these! Thanks so much! I try to meal plan for him every Sunday, though it's been a little hectic the last couple of weeks. He loves his veggies! As always, an inspiration. I think we will try the potato bean balls. Thank you for sharing your healthy toddler meals!